eQSL recebido: EA7JKL, Mijas, Spain, 28 MHz, QSO w/ CD6713. 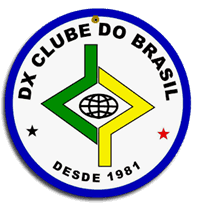 eQSL recebido: PY2COY, Apiaí, SP, Brasil, 18 MHz, QSO w/ PT0S. 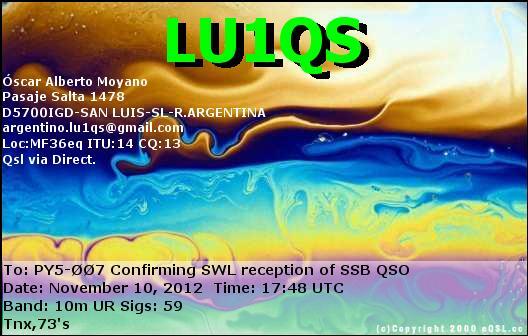 eQSL recebido: LU7DR, Bahía Blanca, República Argentina, 18 MHz, QSO w/ PT0S. eQSL recebido: PY2DN, São Paulo, SP, Brasil, 28 MHz, QSO w/ PT0S. 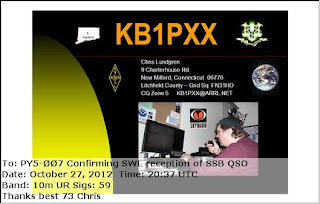 eQSL recebido: EI9KC, Celbridge, Ireland, 28 MHz, QSO w/ PT0S. eQSL recebido: PU2SDX, Caieiras, SP, Brasil, 28 MHz, QSO w/ PT0S. eQSL recebido: KB1PXX, New Milford, CT, United States, 28 MHz, QSO w/ LP1H (CQWW Contest 2012). eQSLrecebido: LU4ERR, Berisso, República Argentina, 28 MHz, QSO w/ IK6CWQ. eQSL recebido: YU2VZ, Beograd, Serbia, 28 MHz, QSO w/ PT0S. 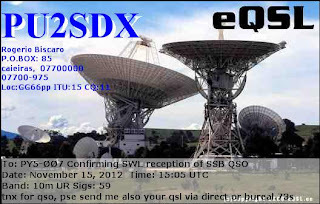 eQSL recebido: PU2PHQ, São José do Rio Preto, SP, Brasil, 28 MHz, QSO w/ PT0S. eQSL recebido: YV4MP, Valencia, Venezuela, 21 MHz, QSO w/ DO4ED. eQSL recebido: PY1PDF, Rio de Janeiro, RJ, Brasil, 28 MHz, QSO w/ LT0X. Confirmação recebida (eQSL): 21.800 kHz – Voice of Islamic Republic of Iran – Sirjan/IRN. Thanks for your letter announcing the ability to receive and listen to our programs in your area. Therefore, if it is possible, we want to know much about you. Secondly, we want to know whether you can speak and understand Hausa language or not. Voice of Islamic Republic of Iran, 21.800 kHz – Sirjan/IRN. 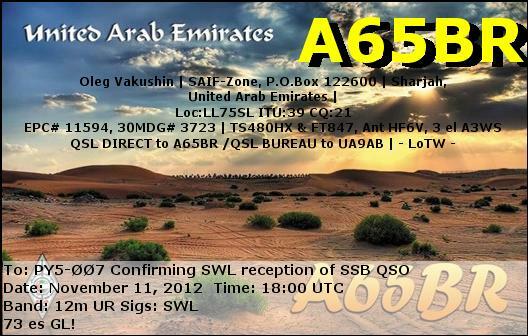 eQSL recebido: A65BR, Sharjah, United Arab Emirates, 25 MHz, QSO w/ PT0S. eQSL recebido: LU1QS, San Luís, República Argentina, 28 MHz, QSO w/ LT0X. 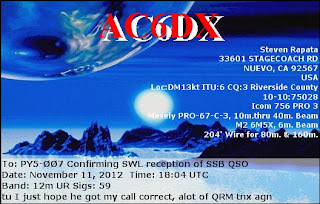 eQSL recebido: AC6DX, Nuevo, CA, United States, 25 MHz, QSO w/ PT0S. 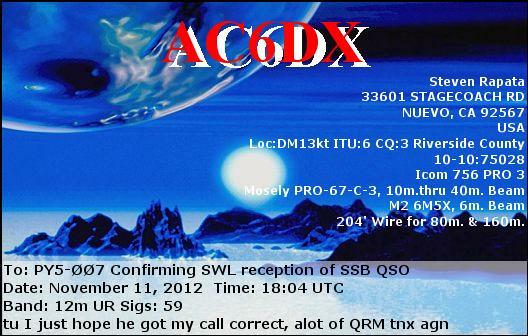 eQSL recebido: KQ8M, Mentor, OH, United States, 25 MHz, QSO w/ PT0S. eQSL recebido: N3EEI, Dover, PA, United States, 28 MHz, QSO w/ LT0X. eQSL recebido: N3EEI, Dover, PA, United States, 28 MHz, QSO w/ JH1AJT. eQSL recebido: N3EEI, Dover, PA, United States, 25 MHz, QSO w/ PT0S. 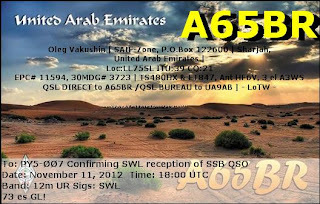 eQSL recebido: KH6CG, Honolulu, Hawaii, 25 MHz, QSO w/ PT0S.